I’m thankful for this blog that has allowed me to pour our my thoughts on something I’m truly passionate about. I mean, I do write notes in my perfume notebook, but sometimes typing is a lot faster and allows me to indulge in my logorrhea. I’m thankful for those of you who read the blog, and who leave encouraging or passionate comments that remind me that I’m not alone in having what many people deem to be a weird obsession. I’m thankful for my fellow bloggers who write so beautifully and who inspire me. I’m thankful for the colours that perfumes bring to my life. I’m thankful for the kindness of people who have sent me samples of things I can’t find. I’m thankful for the amazing opportunities that I’ve had being here in London. This June, I will be leaving London for good. I’ll be heading back to Singapore, and if God allows it, will be moving to the US for a year to pursue my Masters (sadly, not in perfumery!) I’m definitely going to miss this city, which has been my home for the past 3 years and which will always have a special place in my heart. But sentimentality aside, let’s pop the champagne and celebrate! 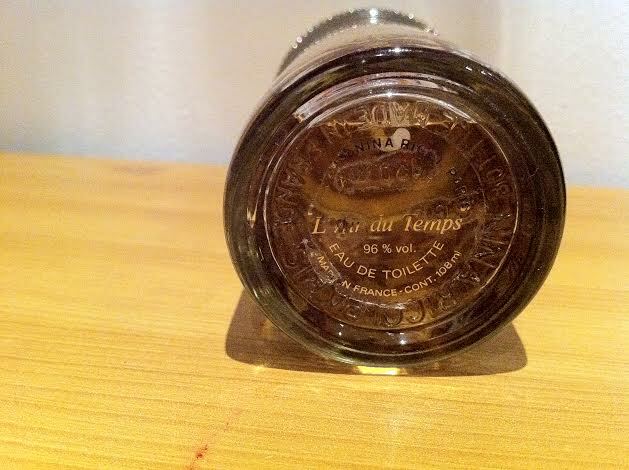 I’ve got a vintage bottle of Nina Ricci‘s L’Air du Temps EDT, and I’ve got no idea how old it is. It’s 108ml and was made in France. Could anyone help me to identify it? I’d also like to host a giveaway for a 10ml decant. To enter, all you have to do is leave a comment about anything at all. You could say hi, talk about your latest fragrance lemming, write a critique of fragrance blogs, or even say, “Fuddy duddy bunnies make the best buddies.” Anything goes. The draw closes two weeks from now, on 2 May, at 12pm GMT +1. Once again, thank you for being on this stupendous olfactory journey with me. I wore L’Air du Temps in high school (early 70’s). I also loved Nina Ricci’s Bigarade. that’s very tough to find now! I’d never even heard of Bigarade until you mentioned it! Now I’ve got to look for it, just to see what it’s like. You’re in the draw. Congratulations Buddy! What an epic milestone. I love your Haiku and you write beautifully. It will be super fun to have you just around the corner in Singapore, now with Scoot so affordable to pop over for a long weekend. Wishing you years of fun in fragrance ahead. Thanks for the love! It’s not really an ‘epic milestone’ – just a small blog by an occasional writer who’s bored! But yep I’m looking forward to visits to Singapore by you guys – I can show you the TRUE perfume secrets that are housed there 😉 Might also pay you guys a visit in Australia in future, too! You’re in the draw. I love the Haikus, what a great idea you had there. I hope you keep on blogging for a long time to come! I used to wear L’air du temps when I was younger, I’m 42 now, so…..that must be when I was about 20! I would be happy to smell it again. Thanks and congratulations for your blog. It is a privilege to re-live the past through scent. And L’Air du Temps is an ageless classic. You’re in the draw. Can’t believe we’ll be losing you from London so soon. Hopefully you’ll continue to blog and I’ll still see you around the blogosphere. I know! I’m saddened by it as well. It would be nice to go sniffing around town with you and the rest of the crowd sometime before I leave! But I’ll definitely continue blogging, barring any major changes in my life (e.g. my nose becomes rotten or my fingers fall off – one never knows haha). 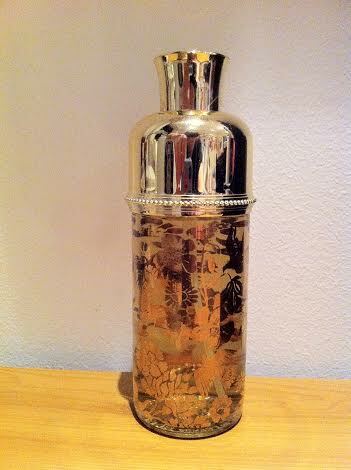 My mother used to wear L’air du temps but its still the only smell I associate with her. I remember vintage looking bottles sitting on her dresser all those years ago. I was also pleasantly surprised when a couple of weeks ago a caught the scent on a very young woman in her late teens/early twenties. Nice to see this classic reaching out to a new generation which is so rare these days in a mass celeb fragrance market! YES! I long for a ‘classic fragrance’ revival to hit this generation. Sigh. I just hope they don’t fade into obscurity. You’re in the draw. Thank you! You’re in the draw. I am thinking that bottle of Nina Ricci is a 50’s or early 60’s bottle…..the earliest bottle of this fragrance was in 1948 I think…….would love to win oh and HAPPY ANNIVERSARY. Thanks for that information! That would make it very old indeed. Whoopee! Still smells great though! You’re in the draw. You’re welcome, and you’re in the draw. It’s coincidence (or maybe fate?) that I was looking earlier today for a vintage bottle of L’Air Du Temps on eBay… It was my first scent, my first perfume love. I’ve never smelled the vintage and I bet it’s just magical. Thank you for the draw! Best wishes and happy blogiversary! I’d love to be in the draw please. I’m on a vintage trip and I’m just eager to try scents of yesteryear out of curiosity. I always feel that I’m an old soul! I know what it’s like to be on a vintage trip. I’m permanently on one! You’re in the draw. I always get somewhat nostalgic and sentimental about the place whenever I move from one country to another. But moves always bring something new to discover, so enjoy the life change and let us know all about it! 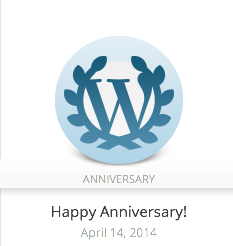 Happy blogoversary, J! sentimental or not, it’s nice to have some kind of a formal milestone to just measure whatever you want to measure – visitors, views, posts, friends you’ve gained or places youvisited. Do not enter me into the draw: since I’ve never tried this perfume and have no emotional ties with it, I’d rather leave more chances to others. Do you know where in the U.S. you’ll be studying? Thank you for your kind words – You’re right, it is nice to measure things; I enjoy reading your posts on statistics! Apologies for the belated congratulations… for you are a truly welcome source of poetry and perfume comment enlivening the internet for all! Thank you for your kind words. I am blessed to be in this community with fine people such as you. You’re in the draw! Conngrats on your 1st anniversary! i enjoy seeing your youtube reviews and reading them here on your blog as well. Thank you. I don’t do any Youtube reviews, though, so you might have mistaken me for someone else 🙂 You’re in the draw. Belated congratulations on your blogging anniversary! No need to enter me into the draw, but I just wanted to stop by and wish you all the best, especially for the upcoming move to the US. I wish I were in New York… but unfortunately I won’t be there. That said, I can foresee that I’ll be visiting New York quite regularly! 😉 You’re in the draw! happy blogoversary and many returns!